Glasgow City Council have a number of opportunities to work within our home care services and facilities management and catering services. To apply for a vacancy please check out our Current FM and Catering vacancies and to see what positions are available. If you find a position you would like to apply for go to how to apply to download an application form and guidance notes. Our range of home care services are delivered to the citizens of Glasgow allowing vulnerable service users to remain independent in their own home for as long as possible. The service is delivered by Glasgow City Council under the management of the Glasgow City Health and Social Care Partnership. We provide a range of diverse facilities management services in a number of private and public buildings across Glasgow, these include cleaning, catering, janitorial and school crossing patrol services. Encore hospitality services is our hospitality and events division which delivers catering in some of the city's most iconic venues. 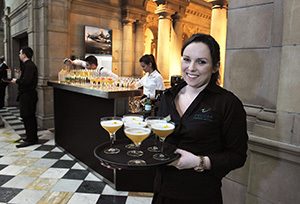 As well as providing quality catering and hospitality facilities within museums, leisure centres and libraries across Glasgow, Encore also caters for weddings and events.